In order to comment intelligently on the methods of test to be adopted as the reference methods for the CEN (European) standard on compression strength measurement for masonry, some data has been analysed. Three main questions are addressed – (1) whether 3 or 5 replicates should be tested (2) What are the implications of using different statistical indicators as the characteristic strength and (3) whether full sized (storey-height) walls or small walls (wallettes) should be tested. It is concluded that three replicates would generally give a satisfactory result but a reduction to two in cases where damage occurs before test would be unacceptable and would necessitate a retest. 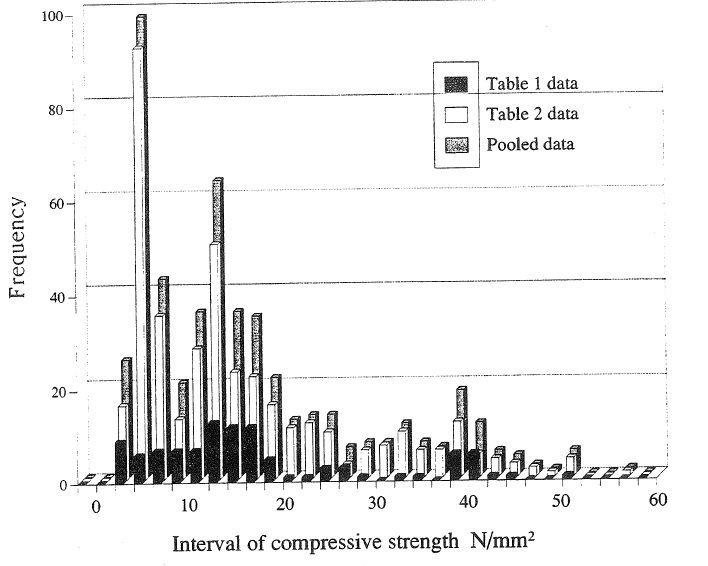 Of the four methods of calculating the characteristic strength, the characteristic mean (char. mean) gives a 15% reduction from the mean (50 percentile) and the EC default method gives a 17% reduction, (equivalent to the char. mean at a CV of 10%). If a normal distribution based 5 % fractile method (@ P=95 %) is used there is 30% average reduction while the same assuming a Log-normal distribution averages 25% reduction. If wallettes are used a correction factor may need to be applied to maintain the safety of brick walls to the existing UK practice but block walls would not require a factor. The data for block walls is very limited, however. The database needs to be widened to improve the reliability of the analysis.